Every week, we review some of the best walks in America. Getting out into nature is good for the mind and body. But did you know that simply looking at nature images can be beneficial? So, whether you’re ready to take a trip to Arizona or just want to see what’s out there, these recommendations are for you! From cactuses and giant rivers to canyons and deserts, Arizona is a startlingly beautiful state. 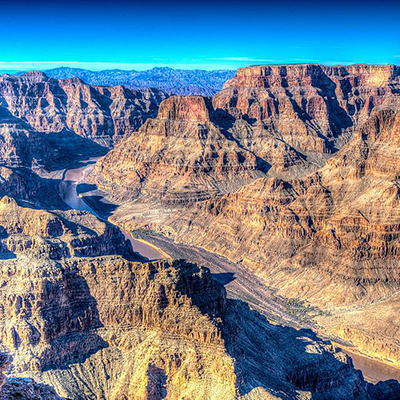 Home to the Grand Canyon and the Colorado River, there are so many amazing walks from which to choose! We picked these four walks because they are good for different skill levels and offer gorgeous views. When you go out for a walk or hike, especially in a place like Arizona, it’s important to remember sunscreen, a hat, sunglasses and water. In addition to being wheelchair accessible, we love this very short walk for the historic view. 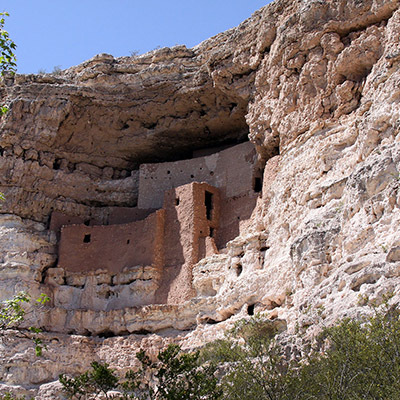 This .4-mile loop gets visitors close to the 1,000-year-old Sinagua ruins. Dogs on leashes are welcome to join you as you see the amazingly preserved ruins. Set into the rocks, you could believe the site was the home of an ultra-rich celebrity — if it had glass windows. There are informative signs along the way and a small museum and gift shop if you are interested in learning more and taking home a souvenir. Get directions here. 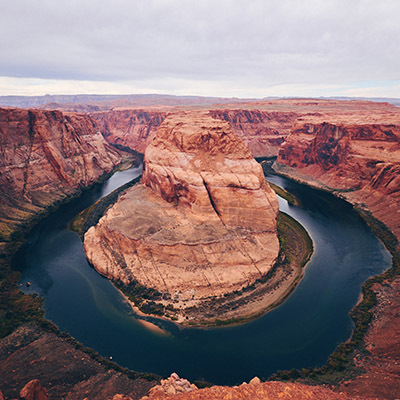 The Horseshoe Bend Trail gives you a phenomenal view of the winding Colorado River. In fact, it’s a view you may have seen on postcards! The blue and green waters of the river shine surrounded by the red rock of Arizona. It’s best to go early in the day as this walk becomes crowded in the afternoon. The parking lot fills up with busses of tourists drawn to the spot for the sight. This 1.3-mile out and back path is good for families and dogs on leashes. Here’s how to get there. 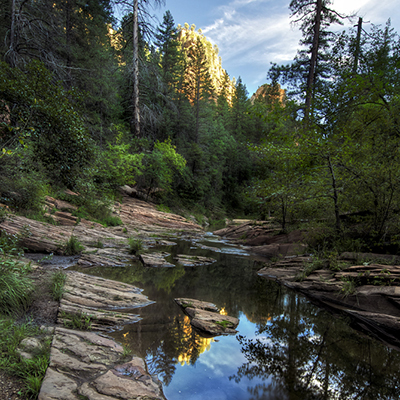 Sedona is well known for its beautiful hiking trails. This 7.2-mile out and back trail is partially shaded by canyon walls and trees, keeping you out of Arizona’s sometimes brutal sun. The path ends at a river that some surefooted folks like to walk through but for people afraid of a fall, it’s better to turn around and enjoy the walk back. For people who do wish to walk in the river, there are more beautiful views but reviews suggest you use hiking poles. Dogs on leashes are permitted and kids can make the trek as it doesn’t require any hard walking. There are places where one must cross a stream multiple times — wear either waterproof shoes or sandals designed to get wet — and the paths are not paved and can be bumpy. While it isn’t difficult, the trail is unsuitable for wheelchairs. People rave about the wildflowers and foliage. Click here for directions. Usually, we end this weekly post with a more difficult trail. This week we just have a long one. The West Rim Trail is a point to point, mostly paved, path that runs 12.8 miles. This trail has phenomenal views of the Grand Canyon. Even better, there is a shuttle that can help you get from one great spot to another! Dogs are not allowed on the shuttle but can walk the path on leashes. The shuttle makes the path far more accessible to wheelchairs and people with lower energy levels or physical capabilities. Click here for more info about the shuttle and directions to the trailhead. Whether you live in Arizona, plan a trip or just enjoy these pictures, we hope you get outside and enjoy the world this weekend!